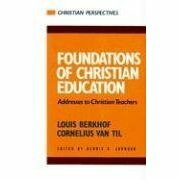 Posted by heldveld in Book Reviews, Christian Education, Christian Parenting, Cornelius Van Til, Louis Berkhof. This book is a collection of essays that were delivered as addresses to Christian Educators in the 1930’s. In the introduction Dennis Johnson, the editor, mentions that these essays deal mostly with the ‘why’ and not the ‘how’ of Christian education. I was a little disappointed, but truly that was what I expected. That being said I’m still looking for a good book on the ‘how’ of Christian education in an effort to evaluate Christians schools as a parent. If you know of one please comment. Yet despite this small disappointment regarding what was not found in the book the topics the authors do cover are informative and helpful in discerning the need for Christian education. Since I have been doing a lot of thinking and research on this subject I hope to do a series of posts on the individual essays in this book. Therefore in this post I will not go into too much detail on the content of the essays. In the first section two essays lay out the necessity for and uniqueness of the reformed education. Van Til writes on ‘Antithesis in Education’ and Berkhof contributes ‘Being Reformed in Our Attitude Toward the Christian School’. These were probably the most important essays in the collection as they form the foundation for the rest of the book. Johnson comments in the introduction that this was his reason for including them first as opposed to at the end as they appeared in the first edition. 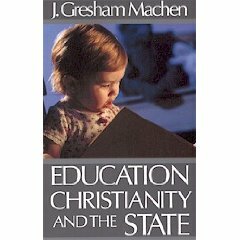 The second section is on the Doctrinal Foundations of Christian Education. Van Til has essays in this section titled ‘Creation: The Education of Man – A Divinely Ordained Need’, ‘Faith: Faith and Our Program’, and ‘Eternal Life: The Full-orbed Life’. The eternal life essay is a great reminder of where our priorities need to be even in education. Berkhof’s essays cover ‘Covenant: The Covenant of Grace and Its Significance for Christian Education’ (my favorite), and ‘Authority: The Christian School and Authority. Overall I enjoyed Berkhof’s essays more than Van Til’s. That may be because I’m a bit ‘Van Tiled’ out, after just finishing Bahnsen’s Vantil’s apologetic so Berkhof’s information may have seemed that much fresher. Those familiar with Van Til’s apologetic arguments will find what he says here familiar. This means Van Til’s arguements are tied very closely to his philosopy, which I beleive to be Biblical, but it was helpful to have Berkhof argueing more directly from the text. This book is unfortunately no longer in print. I obtained by copy on eBay from the seller ‘grape-soda’ who has a good selection of Christian books and provided excellent service. It is a helpful resource to those in favor of Christian education as well as providing many thinking points for those who may be undecided or against the idea.